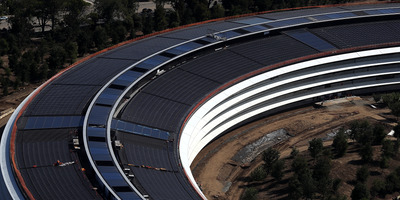 Justin Sullivan/Getty ImagesThe defining design aspect of Apple’s new headquarters is giant panes of glass instead of walls or doors. Apple employees have called 911 three times this year because people have walked into glass walls at the company’s new $US5 billion headquarters in Cupertino, California, Apple Park. The details were reported by San Francisco Chronicle’s Wendy Lee and the story was broken by Bloomberg’s Mark Bergen; you can read the 911 transcripts here. But someone in Apple’s marketing department may have been trying to subtly get the word out sooner – in a big, splashy ad for Apple’s iPhone X that millions of people have seen.